Rhyeca Riley is a Business Development Manager at SERVPRO of Paradise Valley. She has several years of experience in Customer Service Professions. She has a love for animals, sports, and family. In her time away from work she is also going to school full-time studying Computer Science. Matthew Tirpak is a Project Manager at SERVPRO of Paradise Valley. He is certified in Water Removal, Applied Structural Drying & Fire Restoration. He is known around our office for his willingness to go above and beyond for any customer. Matthew has a passion for all things cars – restore, rebuild, paint, parts and driving. When he is not spending time with his family, you will probably find him under the hood! 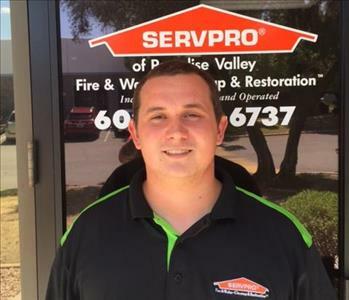 Tyler Riley is a Production Technician at SERVPRO of Paradise Valley. He has the following certifications from the Institute of Inspection Cleaning and Restoration Certification (IICRC): Water Removal Technician and Applied Structural Drying Technician. His strong work ethic and efficiency on jobs have made him an integral member within this company. Tyler has a love for family, cars, and fire arms. In his spare time you might catch him at the shooting range honing in his skills. Dexter Ruiz is the Contents Supervisor at SERVPRO of Paradise Valley. He brings over 5 years of experience within the Water/Fire & Mold Restoration Industry. If your contents are affected, he has you covered! Michael Schwartz is a Production Technician at SERVPRO of Paradise Valley. He has several years experience within the Industry, spanning from the East Coast (North Carolina) then landing here in Phoenix, AZ. Michael has served our Country in the Arizona National Guard, loves nature and being outdoors and enjoys drawing and reading in his spare time. Andrew Tirpak is a Production Technician at SERVPRO of Paradise Valley. He is certified in Water Removal and Applied Structural Drying. Andrew has a passion for cars. In his spare time he likes to restore/rebuild cars and spend time with his wife and beautiful daughter.